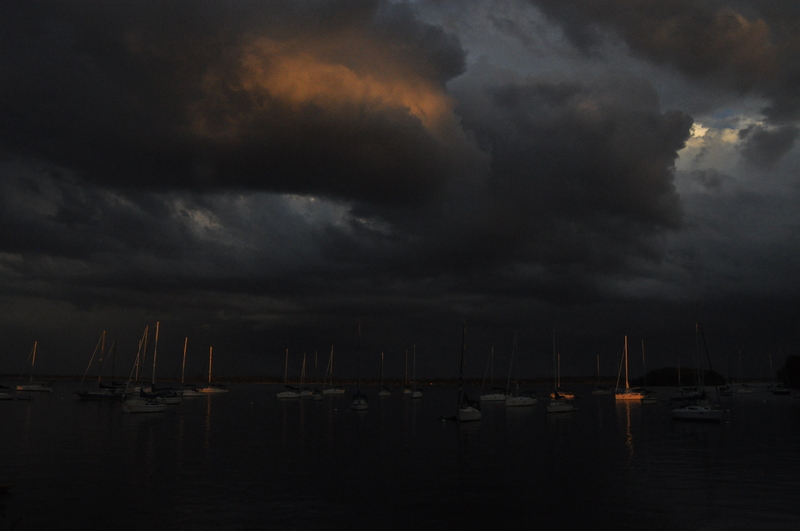 Night falls into the friction of orange energy shattered into the billowing cloud, sail masts piercing the evening mood. Next morning at the early rise of Earth light the dazzle of spider thread captures the sparkle of dew. 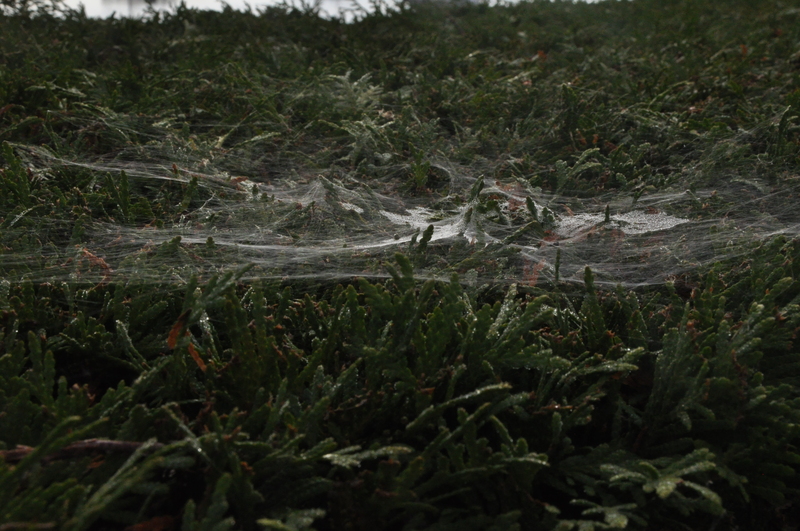 Are these just random web lines scattered across the surface pine hedge ? No this design is an elaborate web of sensing vibration stretched over piercing supports like the night masts of sailboats resting on the lake envelope in a sheltered cove. 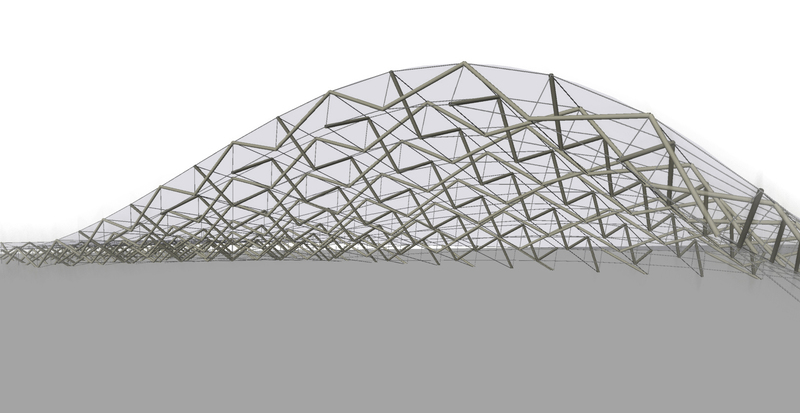 How do these tents of stretched fibers get built ? What forms are they ? 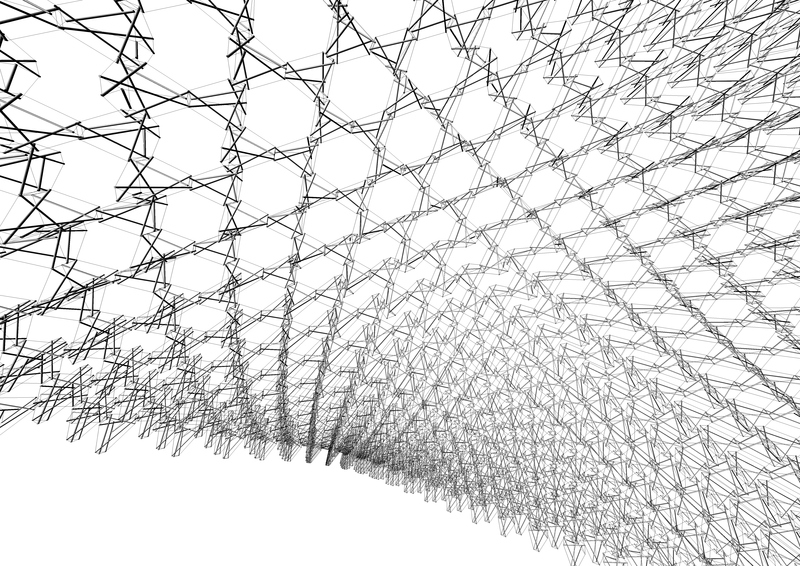 What hidden mathematics float around their woven extension ? 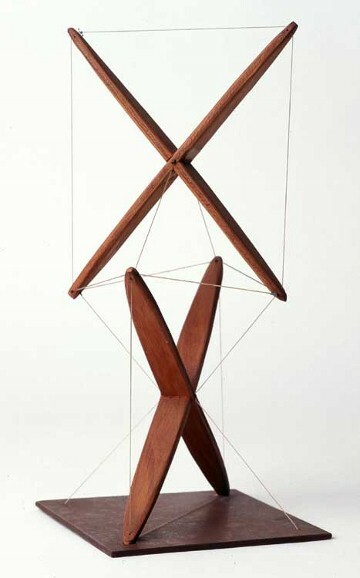 1948, a student Kenneth Snelson presents his design of floating tension into the realm of creativity, proudly elegant in its entirety of simple yet balanced form containing suspended elements attached to each other but a mimic to Nature’s spider support of a ordinary web. Human design is always a mirror to what influence if not the ordinary things that Nature has scattered around us like shells on a beach. It is not the design that catches the eye of the observer it is more the story behind the shell, the rise of evolution in a solitary shape. Shape is the essence of the story of evolution. Shape can transform any surface into a spider’s web. A stretched antenna capable of catching the minute flying insects onto the sticky surface features yet essential to the survival of the spider as food to provide nourishment for another day of existence. 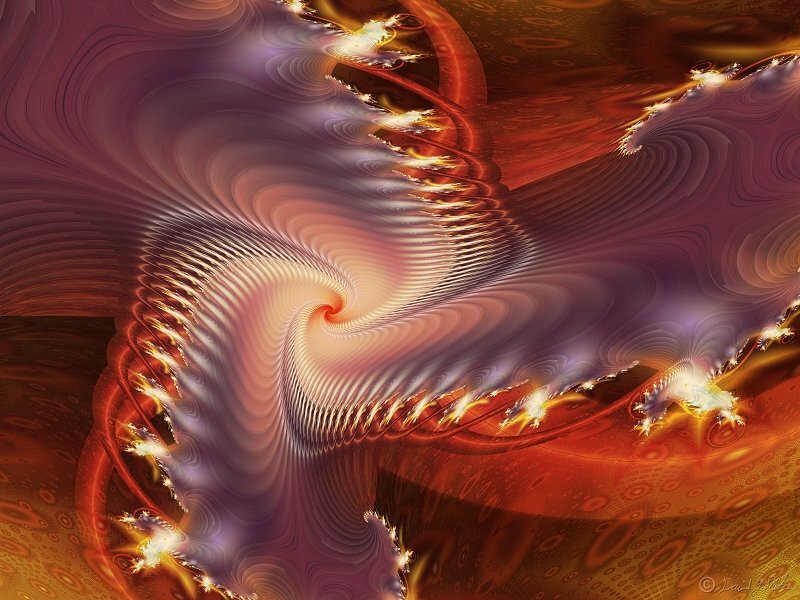 It is this design that Snelson magically captured as if inspired by the spinning spiders web into first recognizing how forces can merge then suspend to flex. How a spiders web can behave like an antenna shape as if listening to the chatter of available insects flying over this capture zone, vulnerable to its purpose. The web is like a bull’s eye shape waiting for an arching insect sweeping into its form. Like an alive weapon efficient in its capture, this spider’s web is an extension of its brain capable of attracting food to it by the design of its silken tent stretched across a pine hedge. The design accomplishes the sensing of shape into an intelligence within the spider a shape of floating tension necessary for the spider’s survival. Shape is not only design it is a sensing capacity to interact with the surroundings, to accomplish a goal of teaching us that design is not just for unique artists like Snelson. Shape is used in Nature to accomplish tasks from snaring food from the air from sensing the very essence of force for sensing the primal force for sensing gravity. Nature has accomplished this since the fog of ancient time as Earth was first progressing one DNA one RNA shape at a time building with design. Building shapes that capture information that capture survival ensuring more designs more floating tensions to experiment with. 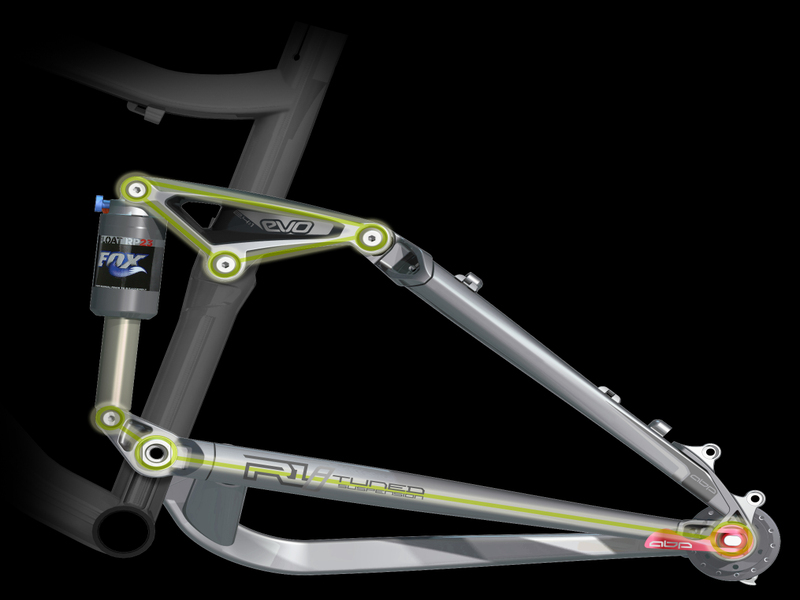 When we think of floating suspension we tend to think of rigid attachments, the sort of angled components of a bicycle. We tend to perceive fixed supports at hinges translating rotating forces by absorbing energy. Yet the spiders tent accomplishes this balance with much more flexibility more absorption of forces more sensing of forces. This bicycle does not sense its surroundings as a floating tension web. We as riders sense its vibrations, but the bicycle is mechanical, without sensing capacity. The spider senses its surroundings through the antenna shape of its web. The Sagrada Familia Basílica y Templo Expiatorio de la Sagrada Familiawas created by the genius Catalan architect Antoni Gaudi used elaborate inverted cables of suspended bags hanging to the effect of drooping lines following the catenary curves to establish his Barcelona cathedral’s central shape upside down first to mimic how Nature senses shape in a gravity field. Gaudi’s genius was to employ floating suspension as a design for first creating the convoluted shapes upside down as a floating tension respecting the shape that gravity gives to the overall flow of curves to support the weight of the cathedral. Gaudi would uproot trees and bushes to study how they were supported in gravity under the ground. 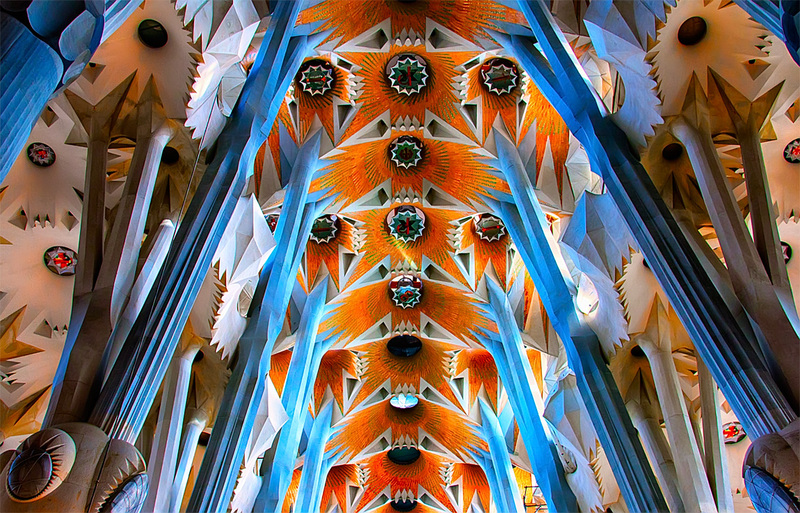 Gaudi like Snelson intuitively understood that Nature designs by using gravity to establish the floating tension network that supports the entire cathedral. Yet the design of floating tension can also be made in the absence of gravity, the way all objects need to be constructed in outer space since support based design will not function in a zero gravity environment. In the matrix of chaos within a gravity vortex we are not familiar with the singularity of space how gravity really behaves. We lose the coherence that a familiar spiders web affords us. We drift easily into incoherence trying to grasp unfamiliar shapes unfamiliar forms we are not prepared to gaze on except for selective observers like mathematicians or physicists not afraid to venture into this different realm. But that is the fabric hidden in the spider’s web this glimpse at the universe outside of our horizon outside of our experiences. Where gravity looms as the sensing force of the universe. We have the Sagrada Familia cathedral to gaze at the floating tension ceiling above our heads the soaring arches that thrill the eye starring from below. As if Aztec designs are swept into concrete clouds shapes hover overhead, shapes of billowing clouds colored into navigation stars to become useful landmarks in the ceiling. Snelson coined the term floating tension to describe the integrity of tension within a network of tension held together within compression elements. Nature builds objects with these identical characteristics both at the nano level within RNA and DNA scalable up to protein molecules scalable further to shapes familiar to the human eye, like bone forces shaping bone cell shape configurations. Snelson never imagined that his artistic vision would 70 years later transcend the elegance of two tension compressed suspended floating elements that would become essential images for how Nature builds shape as its design imperative. Like a cell assembly resting on a surface the inner matrix is a series of elements connecting within a tension net that not only connects each element of the entire assembly can move about this surface as if a self moving robot. 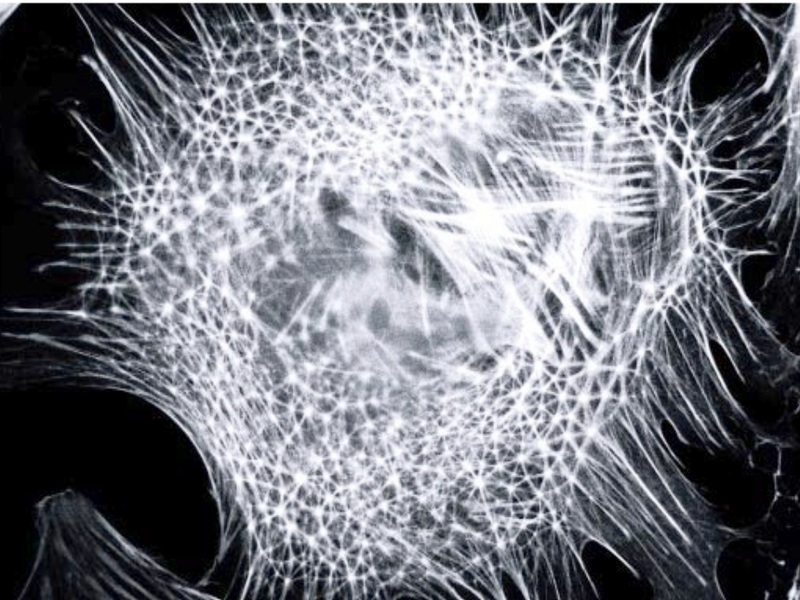 Our cells can perform similar motions yet when linked together they behave in coherence since they are linked both to themselves and into their surroundings. That is the kind of observation that is the beginning of understanding how our brain is actually designed, how it has elastic shape how our brain moves. To understand how a spider web teaches us the importance of design in its survival in its thinking we can spin that observation onto a floating tension communication web that is running our brain. To begin to understand how our brain moves during a concussion a tented spider web begins the exercise to observe first how the brain is designed, what makes the brain hold its own shape. The spider web teaches us the importance of the shape of design that shape can transform itself into a self sensing entity. 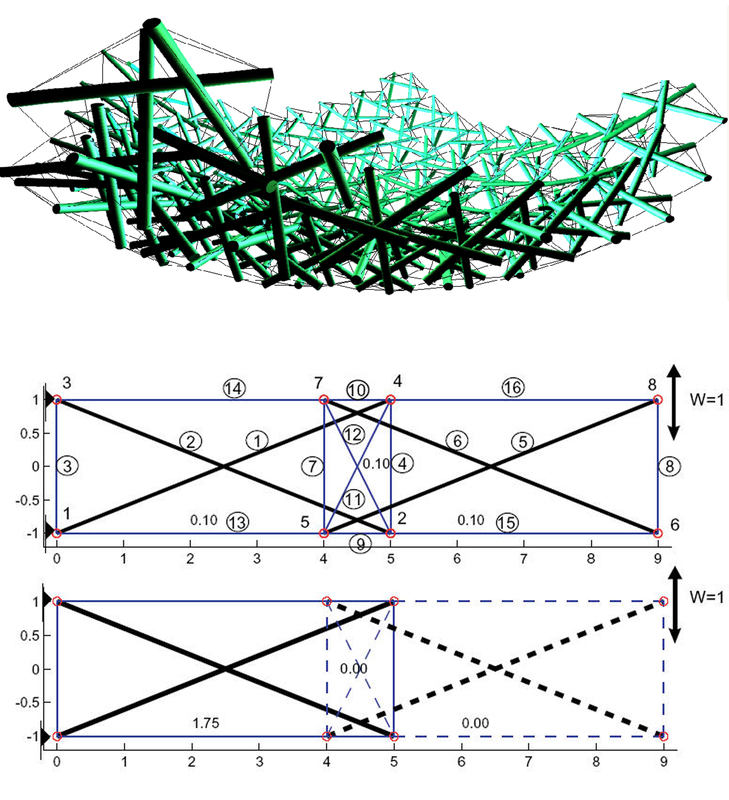 The mathematical version of tension elements within a floating tension surface. Hello! 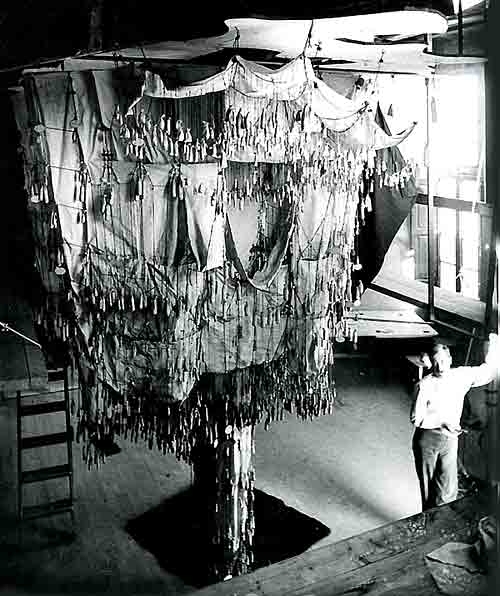 I’m working on a National Geographic documentary and I came across your picture of Gaudi’s hanging model. I would like to know if you’ll kindly allow us permission to use it or if you’ll be able to direct me to your source. Of course, I’ll be happy to chat with you and tell you more about what we’re doing should you be interested. Thanks and I look forward to hearing from you!